An external Platform Services Controller (PSC) can provide scalability and high availability across sites. A vCenter Server initially deployed with an embedded PSC can be reconfigured to use an external PSC by following the steps outlined below. Multiple external Platform Services Controllers can be deployed and an environment can be mixed between the appliance and Windows versions of vCenter Server and PSC. The vCenter Server must be running at least version 6.0 Update 1. The process involves the installation of an external PSC as a new target for vCenter Server. The PSC must be in the same Single Sign-On site and domain as the vCenter Server. 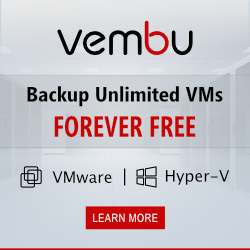 Ensure you have good backups of your vCenter Server. If the vCenter Server is virtual take a snapshot before starting the process, likewise after deploying the new PSC take a snapshot. If the process fails for any reason revert back to the snapshots. An external PSC deployment model cannot be converted into an embedded PSC. 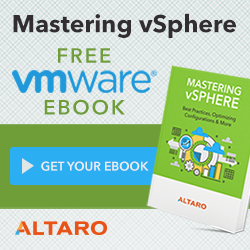 If vCenter HA is enabled then disable and reconfigure after the process is complete. For more information see Configuring vCenter 6.5 High Availability. For Windows all commands should be run as an administrator in an elevated command prompt. For the appliance use the root account for all commands, enable BASH and launch the shell by running shell.set -enabled True followed by shell. The first step is to determine the Single Sign-On site by running the following commands on the vCenter Server: vCenter Server Appliance: /usr/lib/vmware-vmafd/bin/vmafd-cli get-site-name --server-name localhost. Windows vCenter Server: "C:\Program Files\VMware\vCenter Server\vmafdd\vmafd-cli" get-site-name --server-name localhost. Make a note of the SSO site. Next deploy the new external Platform Services Controller, if you require assistance with this see the Deploying an External Platform Services Controller post. The new PSC must be configured with the same Single Sign-On site and domain as the vCenter Server you want to reconfigure. Check that the VMware License Service, VMware Identity Management Service, VMware Security Token Service, VMware Certificate Service, and VMware Directory Services are running. To reconfigure the vCenter Server to use the new PSC use the following command, replacing newpsc with the IP or FQDN (case sensitive) of the new PSC, username, domainname, and password with the relevant SSO domain and user details. If the external PSC is configured to use a custom port then add [--dc-port port] where port is the port number. Check the configuration results. Confirm the vCenter is accessible by logging in to the vSphere web client. The process is complete, if you disabled vCenter HA then you can now go ahead and reconfigure. This entry was posted in vCenter and tagged PSC, vCenter, VMware, vSphere on January 16, 2017 by ESXsi. This post will walk through the process of deploying an external Platform Services Controller (PSC) appliance. The PSC was introduced with vSphere 6.0 to deal with infrastructure services such as Single Sign-On, Certificate Authority, and licensing. For more information on the Platform Services Controller review this KB. Downloaded the VMware vCenter Server Appliance here: v6.0, v6.5. Mount the ISO on your computer. The VCSA 6.5 installer is compatible with Mac, Linux, and Windows. Browse to the corresponding directory for your operating system, e.g. \vcsa-ui-installer\win32. Right click Installer and select Run as administrator. As we are installing a new instance click Install. On the welcome page click Next. Accept the license agreement and click Next. For the deployment type we need to select Platform Services Controller under the External Platform Services Controller heading. Click Next. Enter details of the vCenter or ESXi host where the appliance will be deployed, click Next. Select a location for the virtual appliance and click Next. Select the compute resource for the virtual appliance and click Next. Enter a name for the virtual appliance and configure the root password, click Next. Select the storage to use and click Next. Select the VM network to use and configure the network settings, click Next. Review the deploy Platform Services Controller summary page and click Finish. The Platform Services Controller appliance will now be deployed. In stage 2 we configure the new appliance, click Next. Configure the NTP server(s) and click Next. The SSO configuration page is where we determine if the PSC should be joined to an existing SSO domain or if you are creating a new SSO domain. Enter the SSO domain details and click Next. Tick or untick the Customer Experience Improvement Program and click Next. On the summary page click Finish and Ok. The PSC virtual appliance will now be configured. Once complete we can access the Platform Services Controller in 2 different ways. For the appliance management portal browse to https://IP:5480 where IP is the IP or FQDN of the virtual appliance. Login with the root account. Here we can configure settings specific to the virtual appliance, such as networking, SSH, syslog, etc. To access the user interface browse to https://IP/psc where IP is the IP or FQDN of the virtual appliance. Login with the administrator@vsphere.local account created or defined in the installation wizard. Here we can configure Platform Services Controller related settings, such as permissions, certificates, etc. To join the PSC to an Active Directory domain browse to Appliance Settings, and Manage. Under Active Directory click Join. The Platform Services Controller has now been deployed and configured. Multiple PSC instances can be placed behind a load balancer to provide High Availability, as outlined in this KB. This entry was posted in vCenter and tagged PSC, vCenter, VMware, vSphere on January 15, 2017 by ESXsi.